Montreat is a secluded, beautiful village deep in a mountain cove near Black Mountain. 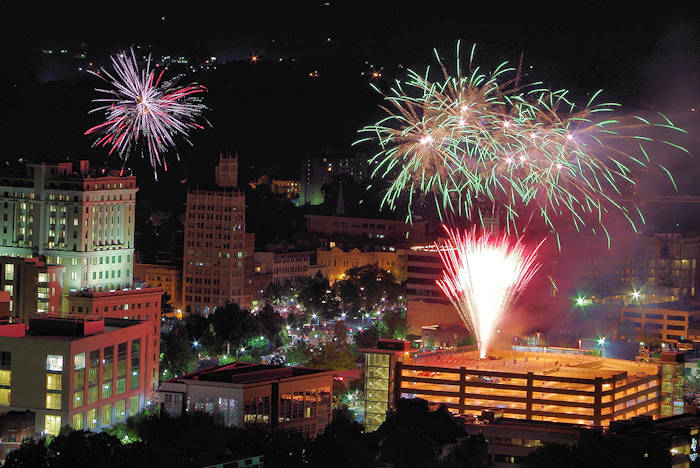 It's best known for Montreat College, Montreat Conference Center and their wonderful 4th of July Parade. At the town center, find Lake Susan surrounded by the beautiful, historic stone buildings. 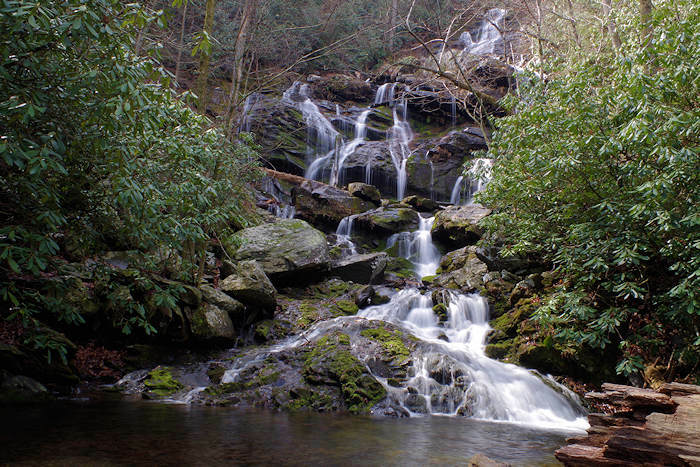 With a population of around 700, Montreat consists of approximately 4,000 acres of land, 2,460 of which are protected under a conservation easement. 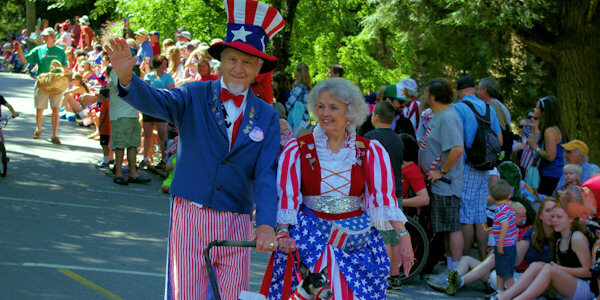 The Montreat 4th of July Parade is a favorite holiday tradition for many. It begins at 10:30 AM, but get there early. This is the most crowded day of the year in Montreat. After the short parade, enjoy other events throughout the day. There's no commercial development in Montreat - not even a stoplight. All of that is a few miles away in Black Mountain. About 30 miles of trails wind through hundreds of acres of wilderness surrounding the town, along creeks, historic structures and to the top of Graybeard Mountain that overlooks the village. 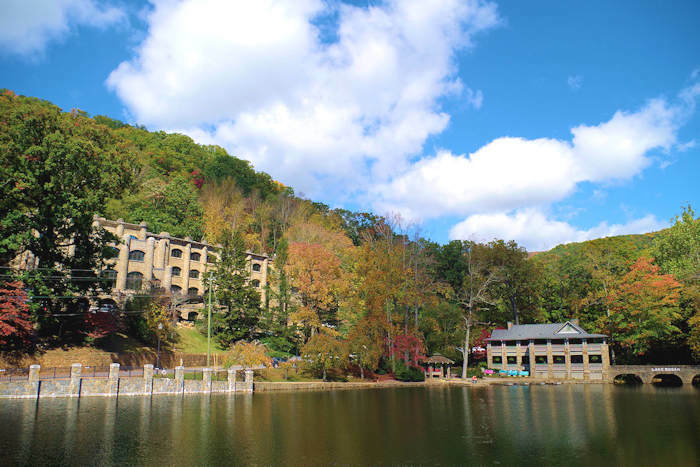 Montreat Conference Center is one of three national conference centers affiliated with the Presbyterian Church (U.S.A.), annually visited by over 35,000 people. The Conference Center includes a hotel (Assembly Inn), several guest lodges, and a stone auditorium seating 2,000. 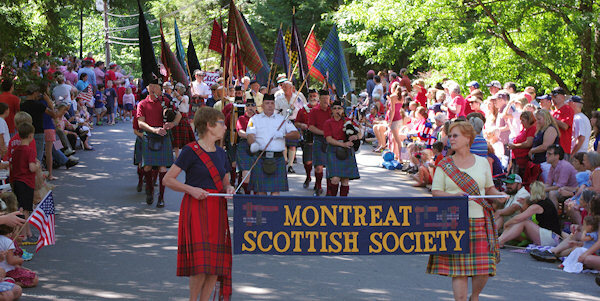 Montreat College is a four-year co-educational liberal arts college that brings many special events to Montreat, including symphonies, plays, community arts festivals, adult learning programs community trips abroad and sports programs. Most of the College's facilities are housed in historic stone buildings constructed in the early 1900's. 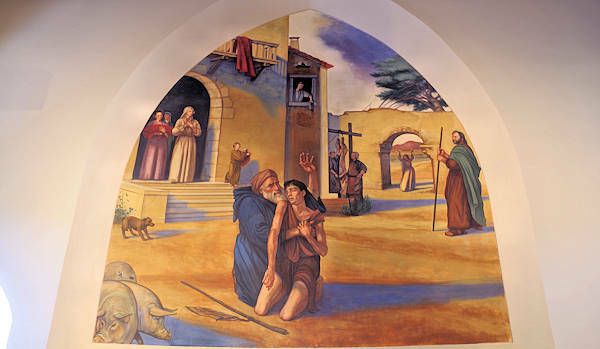 The Chapel of the Prodigal (358 Texas Rd, Montreat) features internationally renowned fresco artist Ben Long's rendition of "The Return of the Prodigal" and is open to the public. Read more about the frescos in western North Carolina. 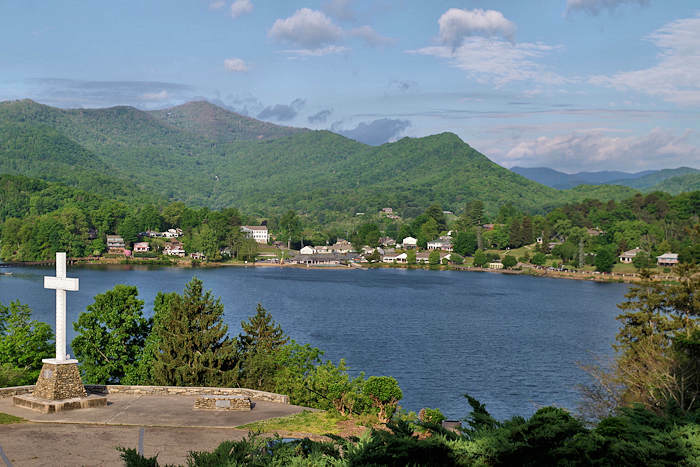 In addition to hiking and a nice greenway, Montreat has five tennis courts, playground, and paddle boating, canoeing, and fishing on Lake Susan. This five-mile hike takes you to the top of Graybeard Mountain (elevation 5,480 feet). Since it's about 10 miles roundtrip with a vertical elevation gain of 2,400 feet, allow at least 4-6 hours. The main Graybeard trailhead is extremely well marked at the end the road that takes you into Montreat from Black Mountain. The trailhead is in the parking area across the road from the Walk Jones Wildlife Sanctuary. Take the bridge across Flat Creek and follow the creek upstream, bear right at the intersection with the Harry Bryan Trail where the trail enters the Boggs Wilderness. The trail intersects the Old Trestle Road. Turn left and follow the trestle switchbacks. Bear right at the Shelter site, and again turn right sharply at the intersection with the West Ridge Trail. Graybeard Mountain is the highest point in Montreat, and the peak has views to the North and East and of the Craggies to the west.Stop at Walker's Knob along the way for some great views. The Rev. Billy Graham, the dynamic evangelist who preached the Gospel to millions during a career that spanned decades, passed away on February 21, 2018, at his home in Montreat at the age of 99. In 1943, Graham married Ruth Bell (1920-2007), whose Presbyterian missionary parents had settled in Montreat, and Ruth graduated from Montreat College’s high school program in 1936. 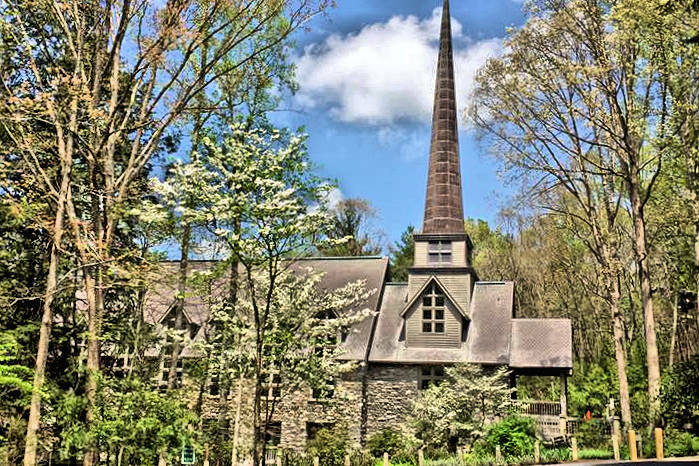 In 1943, Billy and Ruth Graham were married in Montreat College’s Gaither Chapel, which was renamed Graham Chapel in their honor in 2015. The Grahams were common fixtures at convocations, banquets, and building dedications at the college just down the ridge from the Graham home. Their significant personal and financial support during crucial moments helped Montreat College grow into the fully accredited four-year liberal arts institution that it is today. Visit Graham's nearby conference center, The Cove, for a tour to learn more about his life (read more). From I-40, take Exit 64 to Black Mountain/ Montreat/ Route 9 (15 miles east of Asheville). At the exit, turn north on Route 9 and go through three traffic lights in Black Mountain. Route 9 will become Montreat Road, and you will drive approximately two miles to the stone gate at the Montreat entrance. From the gate, continue approximately 1.5 miles to Lake Susan and the village center. Montreat has a big variety of large rental homes that are used for groups such as family reunions, gatherings of friends and more.